In the early eighties many young Adelaide bands had turned to punk or new wave for inspiration. Shoulder pads, white sandshoes and the odd dab of eyeliner were common. Others embraced pop-rock sounds in the manner of better known bands such as Mondo Rock and Australian Crawl. Standing alone were the Kingbees. They were a different proposition entirely - five young men, some still teenagers, playing rhythm and blues in a style similar to that of the early Rolling Stones. They looked and sounded the part. They were infatuated with all things Mick and Keef. For a brief period they were the band of choice for Adelaide’s mod community. The band emerged from the wreckage of mod band The Vents and committed themselves to electric blues, rehearsing for months through the Autumn and Winter of 1982. They rehearsed in guitarist Stuart Harrison’s North Adelaide residence and first appeared at a private party in October 82. Their finely-honed interpretations of blues classics were well received. As well as Harrison, the band also featured ex-Vents Neil Webster (drums) and Dave Robinson (vocals, harmonica). John Scott (guitar, harmonica) and Jason Scholz (bass) knew each other from university and had been recruited by Stuart after a chance meeting at Sharp’s Motor Cycles, the Mecca for Adelaide’s scooter-riding population. The line-up was settled, and the Kingbees were soon ready to play. Around the time of the band’s debut, Neil, Stuart and Dave moved in together, living with other friends of the band in an enormous old house in St Peters. The band-oriented nature of day-to-day life in the house helped provide a near perfect environment for rehearsal and creativity. 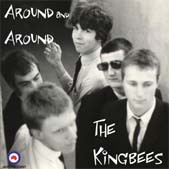 The Kingbees aimed to have over a hundred songs in their set list; they achieved that through the agency of well organised, regular rehearsal. Original numbers were penned by band members and they sat quite nicely alongside the rhythm and blues standards that dominated the set. After playing a few pub gigs with the likes of the Urban Guerillas, Fools Apart and the 4D Men, the band secured a residency at The Saloon, an upstairs club in North Adelaide that had enjoyed a good reputation as a jazz venue in its previous incarnation. Now it rocked to the rhythms of Chuck Berry, Sonny Boy Williamson and Muddy Waters’ tunes every Saturday night. 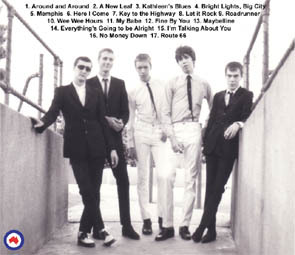 Another major influence on the band was Dave’s copy of the Pebbles “Roots of Mod” LP, a disc that provided a host of suitable songs to cover. Obscure numbers by memorably monikered artists such as Erkey Grant & the Earwigs, David John & The Mood, and (the boys’ favourites) The Fairies started to appear in the Kingbees set. The Kingbees played to appreciative audiences most weekends for about six months, playing long sets that didn’t let up until the wee small hours of the morning. From late-82 until mid-83,The Kingbees were the band for the small number of Adelaide mods. Modernism in Adelaide had been a passing thing for most and, by the time The Kingbees came along, many who had once been part of the scene had discarded their parkas and set off in pursuit of other interests. Such was the appeal of The Kingbees that their audience wasn’t limited to mods; The Saloon’s clientele comprised a cross-section of Adelaide music lovers - hippies, punks, skinheads, old blues aficionados - all sorts. In the main, people got on well; it’s hard to argue while you are dancing. The band performed many memorable gigs at The Saloon. The interplay between the two talented guitarists, the solid rhythm section, John’s inspired harmonica and Dave’s powerhouse vocals all helped to create a sound that, despite the source material, sounded fresh and exciting. Nothing lasts forever and The Kingbees demise came sooner than expected. After more than a year of rehearsals and gigs, some band members were tiring of the genre, and most were tiring of each other. The band’s last rhythm and blues set took place in mid-83 and the night featured a glimpse of what was to come. The Kingbees re-emerged after what appeared to be the conclusion of the evening’s entertainment, and played a short set featuring cover versions of Stranglers, Gang of Four and David Bowie songs. Clearly, times were changing. The remodelled band didn’t last long. The residency at The Saloon was terminated after a minor disagreement with the venue management escalated. Jason announced he was leaving; Dave left; John’s departure wasn’t too far away - before long all that remained of The Kingbees were memories. This recording was made in January 1983 at the studios of 5MMM-FM, a community-based radio station. The set was recorded as a live-to-air session of “The Blues Show”, a regular Sunday night programme. It captures the band just about at its peak (although Dave still hadn’t got the lyrics of “Route 66” anywhere near correct! ), well-rehearsed and full of youthful enthusiasm for the music. It features three of the band’s original compositions as well as a host of blues standards.